UCI rated cyclo cross races unless otherwise stated. The big issue being geo-restrictions on content. That’s it for the season. The last international cyclo cross of the season held at Oostmalle, Belgium. The fifth and final round of the Soudal Classics Series held at Leuven in Belgium. The eighth and final round of the Hansgrohe Superprestige was the Noordzee Cross held at Middelkerke, Belgium. Round seven of the Hansgrohe Superprestige held at Hoogstraten, Belgium. The Krawatencross in Lille, Belgium was the eighth and final round of the DVV verzekeringen trofee. Mid week race held in Belgium that gives new World Champions the opportunity to show off their jerseys, which they did. The ninth and final round of the UCI World Cup Cyclo Cross held at Hoogerheide in the Netherlands. Italian cyclo cross held in the Venneto region. Belgian cross held at Zonnebeke. Hoogerheide warm up race held at Rucphen in the Netherlands. The eighth round of the UCI World Cup Cyclo Cross was from Fiuggi in Itay. A heavy frost and then a thaw never makes for a good course. Luxembourg cross held at Leudelange. Held the day after the national championships this annual first showing of the national jersey’s at Otegem, Belgium. Dutch cross from Surhuisterveen featuring some top names. It was a muddy one! The fifth round of the Swiss National Series held at Meilen. The seventh round of the DVV verzekeringen trofee was the Grand Prix Sven Nys held at Baal, Belgium. The fourth round of the Brico cyclo cross series held at Bredene, Belgium. Elite men live coverage directly below which also includes highlights of Ben and Dan Tulett winning! The Azencross held at Loenhout,Belgium was the latest round of the DVV verzekeringen trofee. The seventh round of the UCI Cyclo Cross World Cup was held at the Zolder Motor Racing Cicruit in Belgium. Swiss Boxing day cross held at Dagmersellen. Round six of the Hansgrohe Superprestige series was the traditional pre-Xmas mid week evening cross held at Diegem, Belgium. 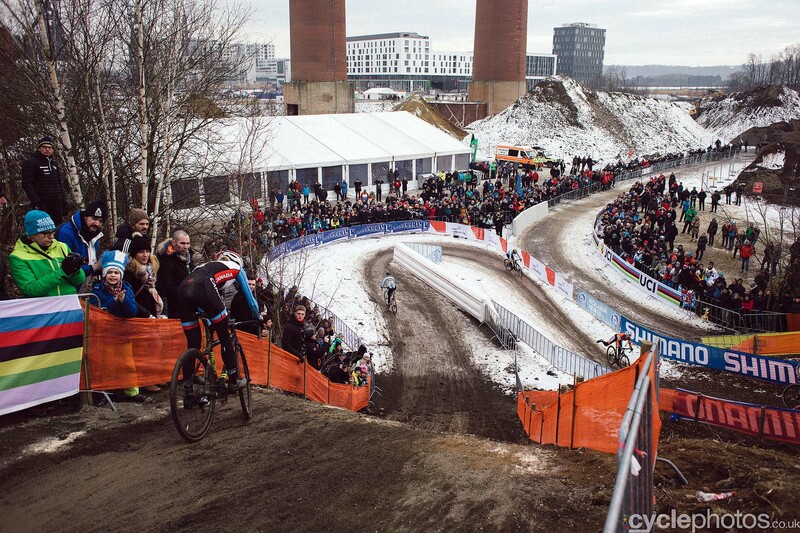 The sixth round of the UCI World Cup Cyclo Cross held at the citadel of Namur, Belgium. Cancelled because of storm damage to the course. The fourth round of the DVV verzekeringen trofee was the Scheldecross held at Antwerp, Belgium. Classic Belgian cross held at Overijse. The third round of the French national series held at Nommay. The fourth round of this Swiss series held at Eschenbach. Once a Spanish World Cup venue but this day it played host to a stand alone event. Two days of cross held at Garland, Dallas, USA. I couldn’t find any video from the event itself but here is some Dallas evening racing. In the USA style, two days of cross held at Hendersonville. Basque cross held at Elorrio. Round four of this prestigous Belgian series held at Essen. The seventh round of this Czech series held at Unicov. Belgian race held in support of the World Masters Champs at Mol on the beach. Spanish cross held at Ametzaga de Zuia. Two days of American cross held at Warwick. Two days of cross in memory of a great star held at Indianapolis, USA. Round five held at Spa-Francorchamps, Belgium. German cross held at Bensheim. Round six of the Czech national series held at Jabkenice. and while we are thinking about it, this from the Berlin Cycle Show 2016. Round five of the UCI cyclo cross World Cup held at Zeven, Germany. Round three of this Belgian series held at Hamme. Italian cyclo cross held at Brugherio. Held at Minamimaki Village, Japan. Round four held at Ipswich, UK. Austrian cross held at Ternitz. The latest round of the UCI World Cup was cancelled because of high winds. Action from Stony Point/Bear Mountain, USA. Two days of cross in Los Angeles, USA. Japanese cross held at Makino, Takashima City. The latest round of this mini series held at Hasselt, Belgium. The fifth round of this Czech National Series held at Slany. It could be Herne Hill but it’s not. Watch this Bavarian TV report from 12.00. The fourth round of the Superprestige held at the infamous Gavere, Belgium. Swiss event held at Madiswil. Two days of racing at Northampton, USA. French cross held at Bagnoles-de-l’Orne. Round three of the UK series held at Houghton-Le-Spring. Dutch race held at s-Hertogenbosch. The fourth round of this Czech series held at Kolin. Round three of the Soudal Classics series was the Jaarmarktcross held at Niel, Belgium. As ever the Belgians took time out in the morning to mark armistcie day and then went ‘crossing’ in the aftrenoon. French race held at La Mezière. Round three held at Ruddervoorde, Belgium. The third round of this Swiss series held at Hittnau. A very muddy Spanish cross. Two days of racing at Louisville, USA. The second round of this mini-series was the Waaslandcross held at Sint-Niklaas, Belgium. Round three of the Czech national series held at Hole Vrchy. Round 2 of the DVV verzekeringen trofee was the Koppenbergcross held at Oudenaarde, Belgium. Italian cross held in Milan. Two days of racing in New Jersey, USA. Held at Mason, Ohio, USA. Not UCI but interesting if with a really bad soundtrack. An evening of cross held in the Netherlands. The third round of the UCI World Cup Cyclo Cross held in the Netherlands on the infamous Cauberg at Valkenburg. Two days of racing at Cleveland, Ohio, USA. Racing in the US capitol over two days. The second round of the UK series held at Abergavenny, Wales. Cyclo Cross held in France for Valkenburg non starters. Tribute race to the now retired Belgian star. Swedish action and note a win for road star Emma Johansson. Mid week cross action from Belgium and one that saw mud and plenty of it! Some great results for us Brit’s especially Thomas Pidcock’s win at the Junior race at Zonhoven and the return of Dan Tullett after illness with third spot. There were also wins for Helen Wyman and Ben Tullett won the youth race at Zingham and was second at the Polder cross. Round two of the Superprestige series held at Zonhoven in Belgium. Two days of action at Boulder, USA. Swiss cross held at Steinmaur. Belgian cross held at Kruibeke. Round one of the DVV verzekeringen trofee, formerly the bpost, held at Ronse, Belgium. Two day festival of cyclo cross held in Helsingør, Denmark. The first round of the French national series held at Erôme – Gervans. The second round of the Czech national series held at Mladá. Belgian race held at Meulebeke. The first round of the Superprestige series held at Gieten, Belgium. The second round of the Swiss series held at Aigle. Two days of racing at Thompson, USA. The first round of the Italian series held at Buja. The first round of this Belgian series held at Neerpelt. The first round of the Czech national series held at Tabor. The second round of the UCI World Cup was the Jingle Bell Cross held at Iowa City, USA. UCI cross held the day after the World Cup race. Round one of the UCI World Cup held at Las Vegas, USA. Two days of racing held in the USA. At the home of Trek a weekend of racing held in the USA. Held in the shadow of the infamous Muur climb and the rather scary Mannequin Piss museum in Belgium. Two days of racing at Rochester, New York State, USA. Two days of racing at Fengtai Station, China. Good rides by Eastern region Grant Martin, James Madgwick and Joanne Newstead.